A learning contract is a voluntary, student-completed document that outlines actions the learner promises to take in a course to achieve academic success. This contract is signed by the student, the instructor, and (optionally) the parent. 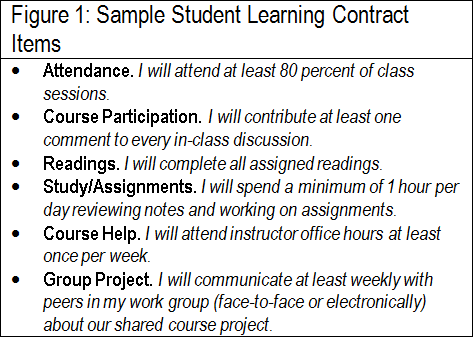 Benefits of all such contracts, however, are that they provide academic structure and support, motivate struggling learners by having them pledge publicly to engage in specific, positive study and learning behaviors, and serve as a vehicle to bring teachers and students to agreement on what course goals are important and how to achieve them (Intervention Central, 2013). The contract is usually completed with the student and teacher in a private meeting. Parents are sometimes involved in the process if there are specifics that need to be completed at home. 1. Statement of Purpose. The contract opens with a statement presenting a rationale for why the contract is being implemented. A sample statement might be: I am taking part in this learning contract because I want to improve my grades and pass this course. 2. Student Actions. The contract lists any actions that the student is pledging to complete to ensure success in the course. Suitable targets for learning contract items might include attendance, class participation, completion of classwork or homework, seeking of instructor help, etc. 3. Teacher Actions. The learning contract can be strengthened by adding a section detailing those actions that the instructor agrees to undertake to support the student. For example, the contract might state that the instructor will respond within 24 hours to course questions e-mailed by the student or will check weekly and alert the student to any missing course work. Listing teacher responsibilities on the contract emphasizes that success in the course is a shared endeavor and can prod the student to take advantage of instructor supports that might otherwise be overlooked. 4. Sign-Off. Both student and teacher sign the learning contract. If the parent is participating in the development of the contract, he or she also signs the contract. Because this document is a kind of 'promissory contract', the student signature in particular indicates a voluntary acceptance of the learning contract and a public pledge to follow through on its terms (Intervention Central, 2013). Figure 1 shows a list of "I will"l statements for a particular student. This is for a student in middle or high school so it is a little more complex and detailed. A student in elementary school may have one or two "I will" statements they are to accomplish during the day (Intervention Central, 2013). 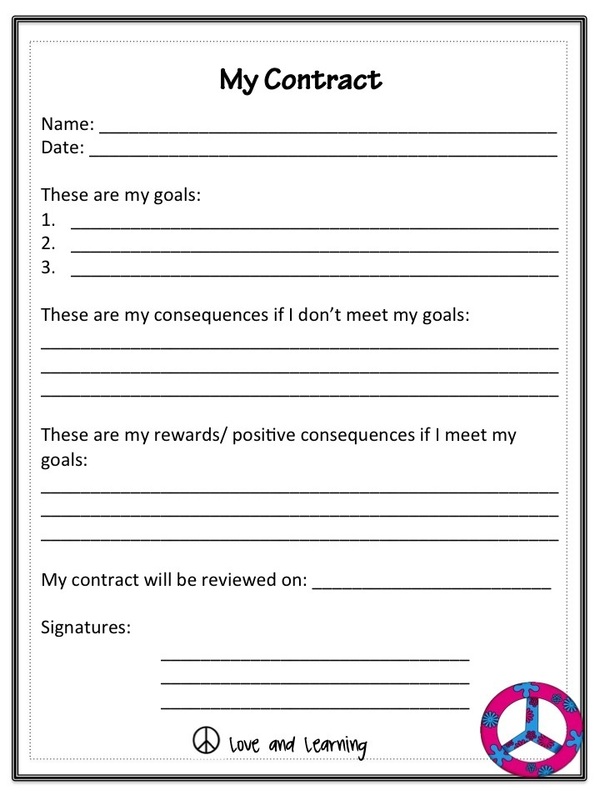 In the picture to the right is an example of a simple learning contract for younger grades. This is easy for a student to go through with there teacher and set personal school goals. These goals can be both behavioral and educational depending on the student.